In the Authorized Version of scripture (KJV) we find Isaiah twice mentioning the “fiery flying serpent.” Egypt is called the place of the “lion, the viper and fiery flying serpent,” (30:6). This fits with classical authors describing pterosaur populations in Egypt and Arabia. Goertzen notes: “The Hebrew word, m’opheph Jpvfm, is a polal participle; a form used only by Isaiah when describing the reptilian saraph. The polal indicates an intensive of the root pvf ooph that means to fly or flutter. 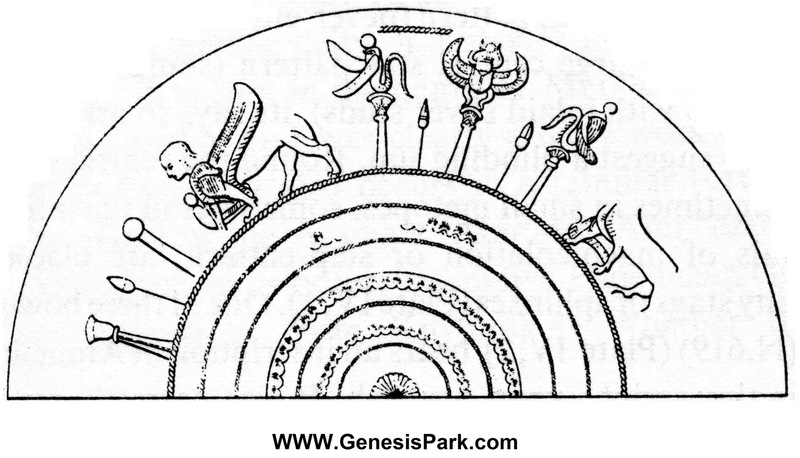 The imperfect form of the polal is found in Genesis 1:20, ‘flying creatures that flutter to and fro’ and Isaiah 6:2 ‘seraphim’ (the same word as the reptiles here used for angelic creatures) that fly to and fro.” (Goertzen, John, “The Bible and Pterosaurs,” 1998.) This same word is employed in Numbers 21:6 to describe the poisonous reptiles that bit the murmuring Israelites. Indeed it is easier to envision an attack of nimble flying snakes (pterosaurs) killing many of the children of Israel rather than them being surprised and killed by snakes on the ground. 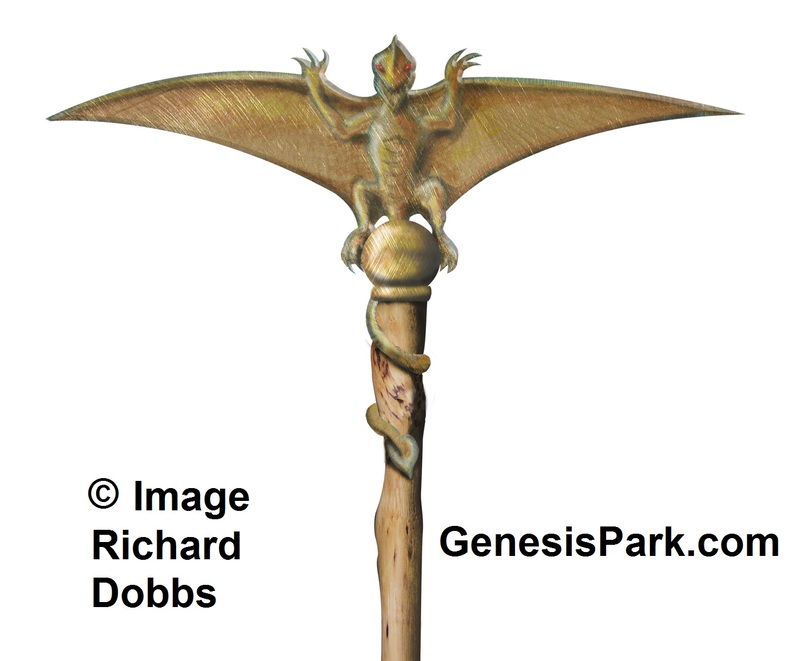 The pterosaur becoming a type of Christ (John 3:14) seems more appropriate than the snake, which from Genesis to Revelation is a symbol of Satan. In addition, the spread wings on the top of the pole would form a cross. 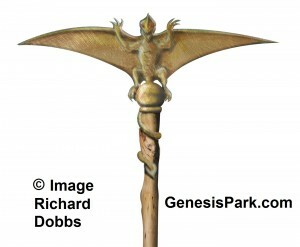 Certain Rhamphorhynchoid pterosaurs had a very long tail. If their legs were incorporated into the wings, they would look very much like a flying serpent. 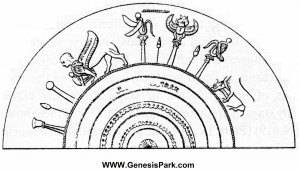 In fact, a plate (right – click to enlarge) found with Sennacherib’s booty at Calah (from the conquest of Palestine) depicts two such winged serpents on poles.II Kings 18:4 tells how the brazen saraph of Moses had become a symbol of worship by Hezekiah’s reign. “It is tempting to identify this emblem with the biblical ‘nehushtan’, the pagan standard or totem pole, set up by Moses to cure the plague of snakes in the wilderness. It will be remembered that this object was preserved in the Solomonic Temple till the time of Hezekiah, who fittingly expelled it from the Temple.” (Barnett, R.D., “Layard’s Nimrud Bronzes and Their Inscriptions,” Eretz-Israel, 1967, p. 3.). The “fiery” flying snake even matches some cryptozoological reports from New Guinea, which attribute to alleged living pterosaurs there a bioluminescent capability like a firefly. For a more detailed analysis, see the published article on The Fiery Flying Serpent.